The Kenneth Myers Centre has been the setting of some of the most pivotal moments in New Zealand’s performance history. Designed as a series of soundproof studios, the building was originally home to 1YA, a government-owned national radio station described at its opening as the “most powerful [broadcasting station] in New Zealand or Australia”. [i] The building has over time also housed a number of television stations, and in 1960, it hosted New Zealand’s first official television broadcast. [ii] The studios additionally provided rehearsal and recording spaces for a number of local musicians in the 1990s. Finally, in 2001, the building was refurbished by The University of Auckland for use by the School of Creative and Performing Arts, ensuring that the Centre’s legacy as a hub of performance will continue into the future. Yet the rich lineage of performance activity at this site is known to relatively few beyond its current occupants. From street level, the neo-Romanesque architecture gives little away, although the steel radio transmitter on the roof and the re-cast 1YA entrance lamps at the entrance hint at its performance heritage. What appears to be a single story deceptively masks three further stories descending a steep slope. It is here, beyond the public’s purview, that numerous performance spaces — including dance studios, music classrooms, video edit suites, sound studios and practice rooms — can be found. Indeed, what we know of a historic building is often influenced by the spatial features of the site. In her essay, Kinds of place at bore place: Site-specific performance and the rules of spatial behaviour, Fiona Wilkie discusses the importance of various “spatial rules”. These, Wilkie writes, are “the sets of rules operating within the site [that] guides users towards particular modes of experience”. [iii] The most unwavering among these rules are the physical structures of the building, which can either facilitate or restrict access and movement. 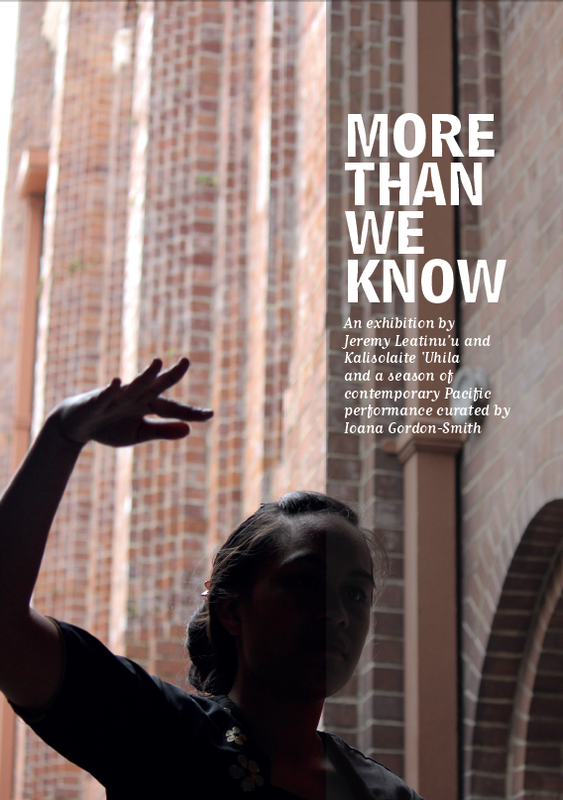 More than we know: performance is a series of site-specific and site-based performances that explore how the physical features of the Kenneth Myers Centre influence social interaction, and by corollary the knowledge we have of the building. Between 6-22 March 2013, various areas around the building will be occupied by one of seven performances. These works are intended to interrogate, expose and disrupt the structures that can limit public awareness of the Kenneth Myers Centre’s histories and functions. The performers in this series have identified two particular physical features of the site that are crucial in negotiating the relationship between the site and the public. The first is the architecture of the Kenneth Myers Centre itself. Its 55 cm, double-layered brick walls and the triple-glazed glass have been custom built to prevent passersby from both hearing sounds coming from the building and from disrupting recording inside. There are no views either in or out of the building. The few windows facing Shortland Street look out upon a concrete wall, as if the building were encased within an architectural shell. The second spatial feature that performers have responded to is the space that lies between the Kenneth Myers Centre and the street. Each of the outdoor performances occupies a space on this border, including the front entrance steps, the steps that lead down the side of the building, and the roof. These spaces are identifiable as the relational space between the public and the Centre itself. A number of performances draw attention to the ways that these two physical features shape interaction between the site and the public. Slippage of sound through the building into the street is the focus of Darcell Apelu’s untitled performance. Apelu uses modern audio equipment to amplify the sound of her breathing. By turning the speaker inward and holding it tight against her torso, Apelu uses her body as a surrogate of the building’s insulation to stifle the output of sound. Only the quietest of noises seep out of the edges of Apelu’s embrace. 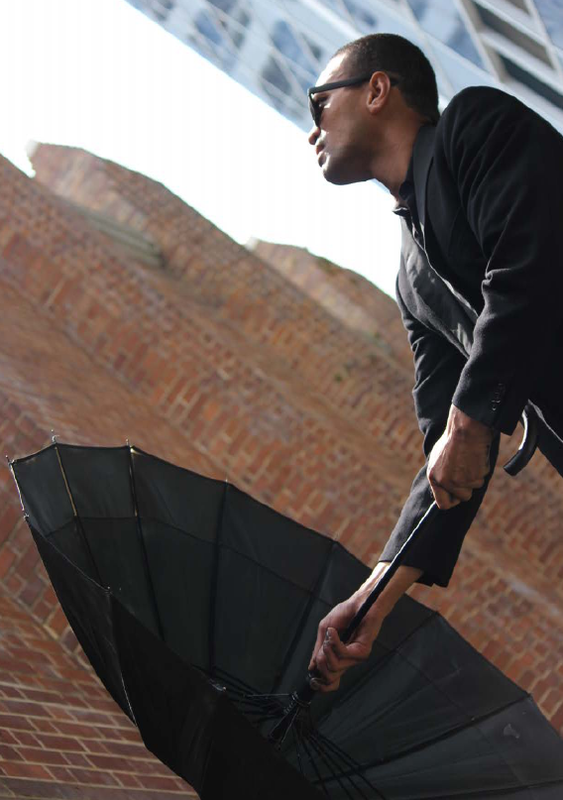 Similarly, in Under my umbrella, dancers Terry Faleono and Pera Afato employ an umbrella as a metaphor for the building’s visual impenetrability. An interest in how the public approaches the Kenneth Myers Centre is evident in Nastashia Simeona Apelu’s untitled whip performance. The unconventional, echoing sonic boom created as the whip cracks inevitably draws the public attention. During the photo shoot for this catalogue, dwellers watched from their apartment balconies, teenagers hollered from the nearby car park, and many others crossed the road to watch from the safety of the other side of the street. Yet, while attention grabbing, the whip-performance is visibly dangerous. Get too close and — snap! — you may get hurt. 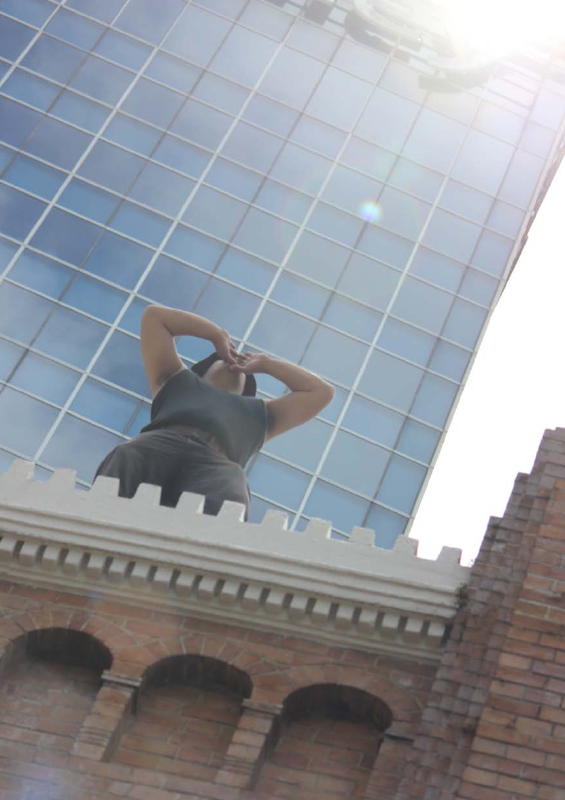 Simeona Apelu’s performance thus creates a periphery of danger that prevents any practical attempts to enter the building. Her performance draws attention to the space she occupies — the frontal steps that bridge the building and the public footpath — as an intimidating threshold to cross. With varying degrees of confrontation, each of these three performances suggest a paucity of exchange between the Kenneth Myers Centre and the street. Little sound or movement emerges from the building, and so too do few people venture into the studios. It’s important to note that many visitors do enter the building in order to access the Gus Fisher Gallery found on the top floor. The performance activities taking place in the studios on the levels below, nevertheless, remain little known. Paradoxically, by drawing attention to the presence of a boundary, these three performances announce that there is more to the building than meets the eye. The remaining performances employ tactics of displacement to disrupt the perceived boundary between the building and the public. In their performance Niu Navigations, a spoken poetry company, take sounds heard inside the Kenneth Myers Centre to a public audience. Modern spoken poetry — an art form that emerged in the 1980s in order to seek a broader audience for poetry outside of academic institutions[iv] — provides a particularly apt medium for this purpose. From the frontal steps, each of the five poets comprising Niu Navigations perform a poem they have penned in response to Jeremy Leatinu’u’s soundscape work, Spatial resonance. Currently on display as a projected installation in the Gus Fisher Gallery of the Centre, Spatial resonance documents Leatinu’u producing sound in three spaces around the building: the courtyard, the stairs leading down to the courtyard, and the undercarriage hidden beneath the frontal steps. By referencing a soundscape encountered inside the Centre, Niu Navigations echo, in reverse, Leatinu’u’s act of bringing sound from outside to the indoor environment of the gallery. Movement is also resituated outdoors by way of a trio of dances, performed by The University of Auckland’s dance students. Peace, Pak’n’saved and If I was a boy were each originally conceived, practiced and assessed in the Kenneth Myers Centre’s dance studio by choreographers Joshua Grace, Seidah Tuaoi and Nita Latu respectively. They have been adapted for a new stage on the frontal steps of the Kenneth Myers Center, quite literally bringing dance from within the building outside. Providing displacement of a different nature is a medley of contemporary and traditional Tongan dances, performed by Auckland dance company Pukepuke ‘O Tonga and choreographed by Sesilia Pusiaki. Staged on a Saturday evening as during extended hours, Pukepuke ‘O Tonga’s performance offers the only work to take place inside the building. In contrast to the other performers, Pusiaki aims to resituate the public audience, rather than the performance. The piece begins in the foyer — a familiar place for visitors to the Gus Fisher Gallery. The dancers then lead the audience into a studio known to students as the ‘black-box’ on the level below. Little known to the public, this studio is where many local television shows, including national telethons, were broadcast up until the 1990s. Pusiaki uses the familiarity of the foyer, and the publicised event, to draw the audience into the building and then into the studio space. In addition to drawing attention to the performance activity associated with the Kenneth Myers Centre, the act of moving a performances or an audience into an alien setting prompts a renewed sensory engagement with the building itself. For the outdoor performances in particular, displacement is an act of trespass upon the expectations of those passing by an otherwise familiar public space. The incongruous and unsolicited spectacles are intended to shake up the complacency, or even apathy, with which the public regards the Kenneth Myers Centre. The outdoor performances are staged at 5.00 pm each weekday, increasing the reach of the performances as hoards of workers hurry home from work. Theatre historian Christopher Balme has observed a growing trend in Pacific theatre towards similar strategies of displacement, whereby indigenous Pacific performance is placed within conventional European contexts. [v] Balme argues that this preserves potentially endangered cultural knowledge while also achieving a multi-cultural situation. 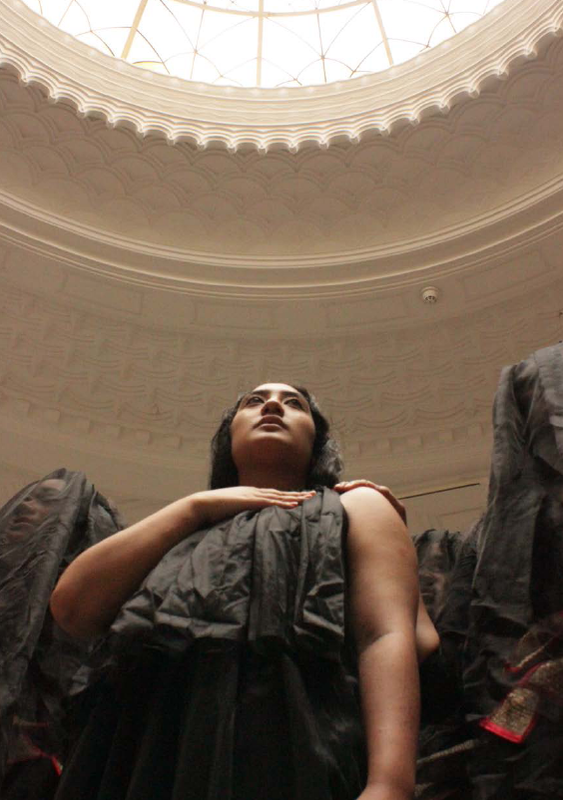 Performance artist Kalisolaite ‘Uhila has previously called this amalgamation of influences “poly-cultural”, playing on the prefix ‘poly’ as meaning both ‘Polynesian’ as well as ‘more than one’. [vi] A number of artists in this series draw upon this trend, preserving Pacific traditions within contemporary Western environments. Pusiaki’s choreography draws on esoteric dance forms particular to her Tongan village. Similarly, Seidah Tuaoi’s performance hybridizes Pacific and Hip Hop dance styles. Performing on the boundary — both cultural and physical — provides ample opportunity to import elements from one space into another. This is perhaps the most evident in Uiaki fono (town crier), which both publicly proclaims the building’s history of sound and invites people to the building. From a raised platform in front of the steel transmission tower on the rooftop, Kalisolaite ‘Uhila projects the sound of Tongan drumming. The resulting echo above the street is deliberately reminiscent of the building’s previous function as a radio and television broadcaster. However, whereas radio functions to disseminate sound from one location to many others, Uhila’s interest is in using sound to draw people together at one site as a community. Only partially visible from street level, ‘Uhila’s unexpected drumming infiltrates the street without any obvious source, prompting listeners to seek the origin of the rhythmic sounds. Uiaki fono thus functions as a welcoming call to gather and notice the building’s performance, and particularly communication, history. ‘Uhila combines drumming with chanting in Tongan in an encore performance. Chanting in public is inherently social, and has been traditionally used in Tonga, in the absence of radio technology, to call people together in order to pass on information. [vii] In his second performance, ‘Uhila is also joined by Jeremy Leatinu’u, who re-enacts the soundscape work Spatial Resonance, described above. 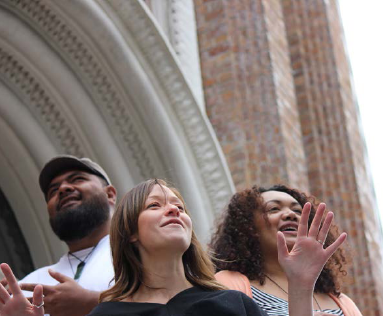 This collaborative performance transforms the spaces around the building quite literally into a place of conversation as ‘Uhila and Leatinu’u employ drumming, vocal calling and rhythms created using the building’s exterior surfaces to respond to each other in turn. Each of the seven performances emphasises the significance of spatial factors in shaping our perception of the Kenneth Myers Centre. While the performances indicate that there is currently limited appreciation of the building and its history of performance, they also suggest that these barriers can be reconfigured and overcome. The role of the border between the building and the street vacillates. It can act as a boundary or threshold, or even a place of exchange. Consequently, these boundaries are a place of constant negotiation. How they function influences our perceptions and awareness of the site’s cultural contributions. These performances draw the audience into the conversation. Essay published in a catalogue to accompany More Than We Know, an exhibition co-produced by Jeremy Leatinu’u and Kalisolaite ‘Uhila for the Gus Fisher Gallery, Auckland. March 6 – April 6 2013. More Than We Know performance series took place from from 6-22 March. [i] ‘New 1YA: Powerful station’, Evening Post, Issue 20, 24 January 1935, p. 21. [ii] ‘The Early Years’, http://tvnz.co.nz/content/823802, accessed 21 January 2013. [iii] Fiona Wilkie, ‘Kinds of Place at Bore Place: Site-Specific Performance and the Rules of Spatial Behaviour’, New Theatre Quarterly, 18 (71), 2002: p. 246. [iv] Susan B. A. Somers-Willett, The Cultural Politics of Slam Poetry: Race, Identity, and the Performance of Popular Verse in America, Michigan: University of Michigan Press, 2009, pp. 2-3. [v] Christopher Balme, Pacific Performances: Theatricality and Cross-Cultural Encounter in the South Seas, Hampshire: Palgrave Macmillan, 2007, p. 216. [vi] Kalisolaite ‘Uhila, ‘Sound makes the Mark – Mark makes the Sound’, 2010. http://visualartsgrads.aut.deploy.gravitate.co.nz/html/detail.php?id=1474, accessed 21 January 2013.